Stampin' Up! has introduced a beta site for crowd sourcing stamp set ideas. The theme for the current campaign is Illustrated Sayings, Plays on Words, Puns. The winning ideas can earn prizes, and *may* get to see their idea produced as a real, live, Stampin' Up! stamp set!!! I came up with the idea below, and if you like it, I would LOVE it if you would PLEASE VOTE FOR ME. Simply go to the link to vote--and click the words "Love this!" near the top left corner of the idea, when you get there. You will need to register before you can vote, but it's FREE and it only takes a moment. And it would mean so much to me :-D The voting ends at 11:59pm MT on August 31st, so please check it out soon. 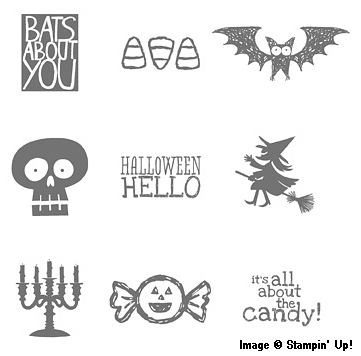 And don't forget, you can make ANY of your ideas into your own stamp set with Stampin' Up! 's NEW stamp carving kit, called UNDEFINED. It's super fun, and perfect for those inside jokes with friends, or for images that hold special meaning for you, but you can't seem to find them for sale commercially. You can get the UNDEFINED Stamp Carving Kit to start, which includes the tools you'll need. Then, simply purchase the UNDEFINED Refill Kit, to get more consumables. 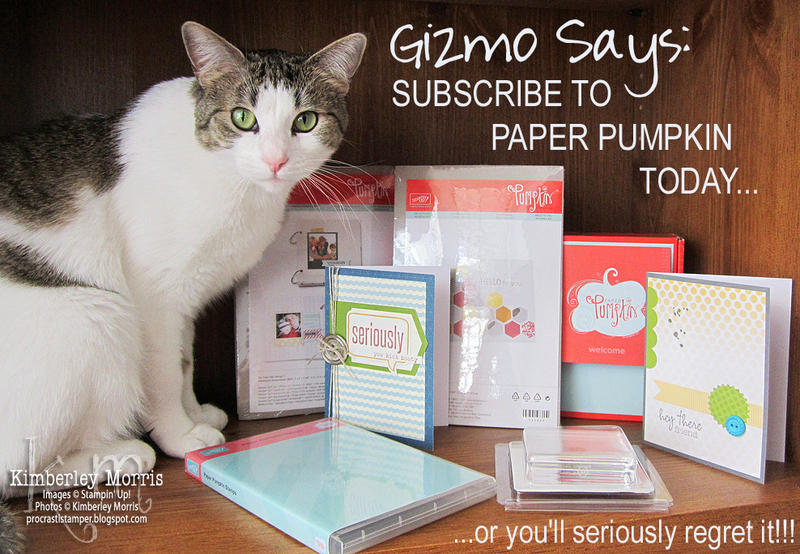 My cat Gizmo wanted to drop a quick reminder that the PUMPKINDEAL promo code offer ends August 31st. Here are more DETAILS, but the gist is that you get Paper Pumpkin for only $10/month for your first two months. The regular price is $19.99 so that is almost a 50% savings! And, for your convenience and savings, the Tags 4 You stamp set comes bundled with the Bracket Label Punch at 15% OFF! You can choose the Wood-Mount Tags 4 You set + Bracket Label Punch, or the Clear-Mount Tags 4 You set + Bracket Label Punch. If you choose Clear-Mount, please ensure you have some Clear Blocks and Stamp Accessories to use with them! UPDATE: Seriously, take a few minutes to enter the LNS 2013 Fall Treasure Hunt. If you are a US player, you could WIN ALMOST $125 in FREE STAMPIN' UP! PRODUCT!!! I like to make a 3D project to start. 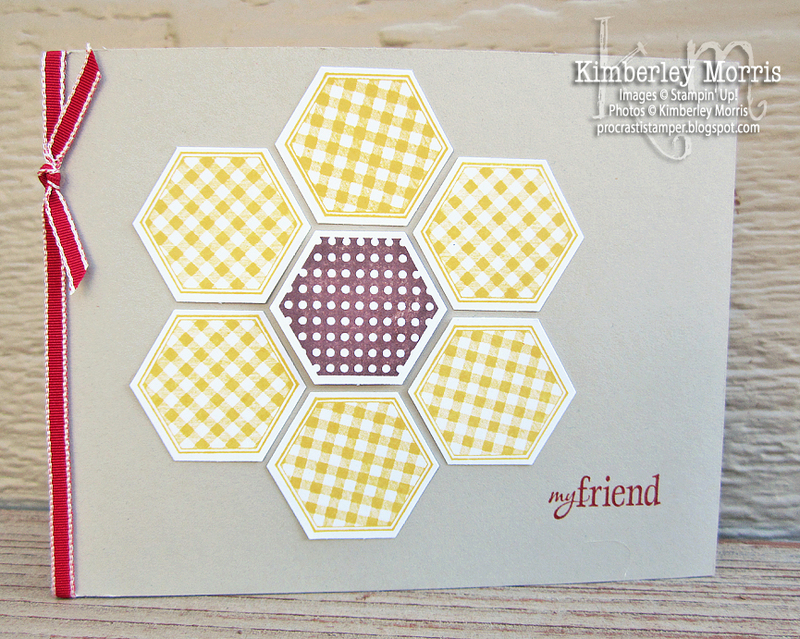 This is a simple project, inspired by the Make & Takes that Stampin' Up! provided for us at their 2013 Convention in July. I do have to admit that I normally Take & Make those projects, and use the time at Convention for something else! Anyway, I modified the design just a bit because I wanted the bag to be recloseable. My sample is held closed at the top by the mini clothespin, so you don't have to tear it to get into it. I also designed the project to use only the Tag a Bag Gift Bags (yes, they come flat, but can be 3D with a few scores and snips), the Tag a Bag Accessory Kit (which includes *everything* used on the bag except the stamp & ink), and the 2013-2015 In Color Marker Assortment (you get both Calypso Coral and Coastal Cabana in there), and the stamp. In all honesty, you will probably want the Stamp-a-ma-jig to ensure you stamp your image where you want it on the tag. The Tag It stamp set (available in wood-mount or clear-mount) works great with the Tag a Bag products! 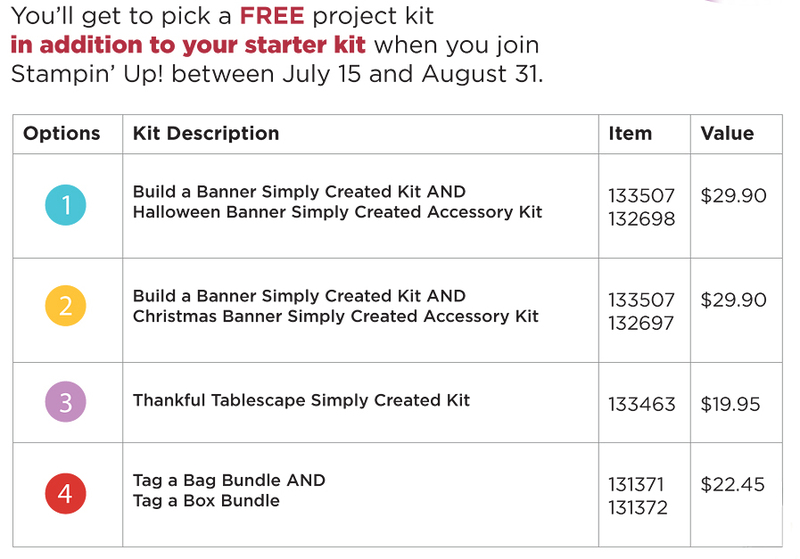 NOTE: Check out the Starter Kit Special, available only til 11:50pm MT on August 31st, which allows you to PICK A KIT (see choices below) when you Join My Team! 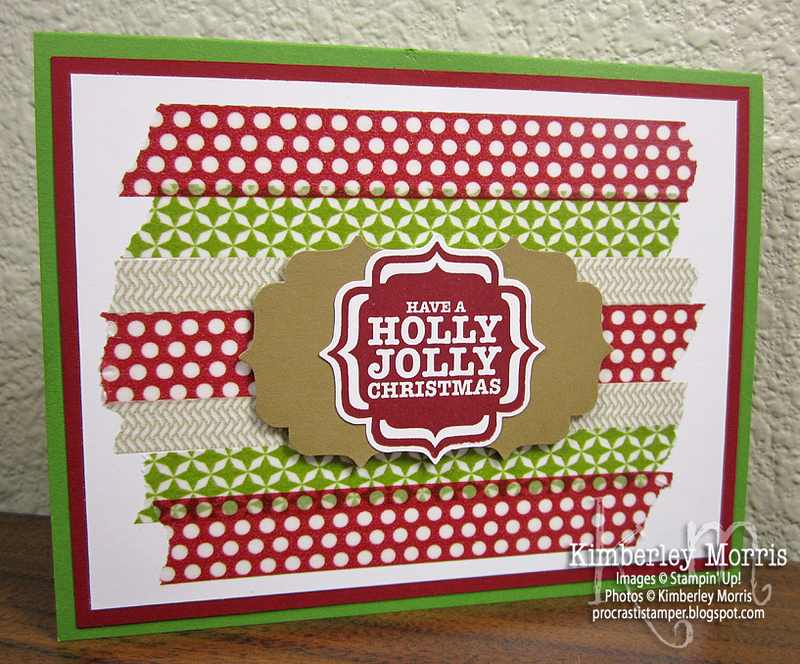 This last project features the Thinlits Label Card Die set. Because there are so many little pieces to this set, I didn't bother to do much stamping. I did, however, feel that the Bella Boutique wheel inked in Versamark, added just the right amount of pizzazz without being too distracting. 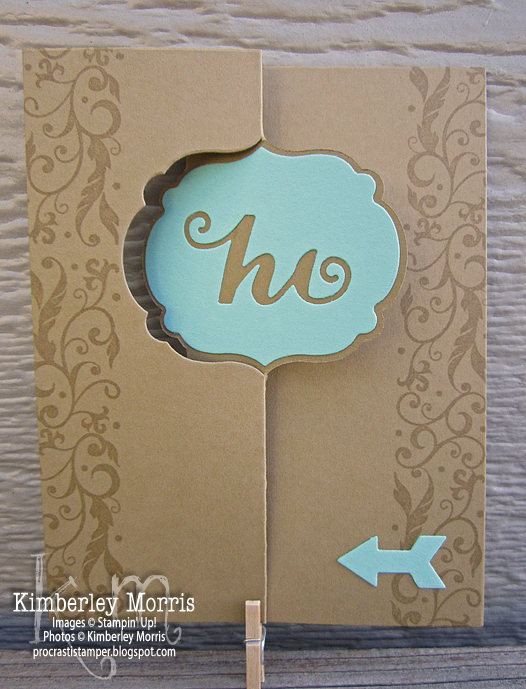 The base is Baked Brown Sugar card stock, and the front label is Coastal Cabana card stock (and both those colors can be had together in the 2013-2015 In Color Card Stock Assortment). I made the panel on the inside of the flip label in Very Vanilla card stock. I figured that would make a great place to jot a little note. FYI: the Thinlits Card Dies make standard 4-1/4" x 5-1/2" cards when folded flat, so they will fit any of our Medium Envelopes (Whisper White, Very Vanilla, or Crumb Cake), as well as our Clear Envelopes. This is a view of the card when folded flat. This is what you'll see when you pull the card open. That's it for my August 2013 Workshop! I'm sorry if you couldn't make it. Leave a comment, or email me, if you have any questions about the projects, or have any problems finding the products in my ONLINE STORE. I will try to get a video posted for this Workshop, but it may not be for about a week yet. My kiddos are heading back to college, so we are getting them all packed and ready, and moved. Guess who's going to miss the kids the most...? GIZMO! 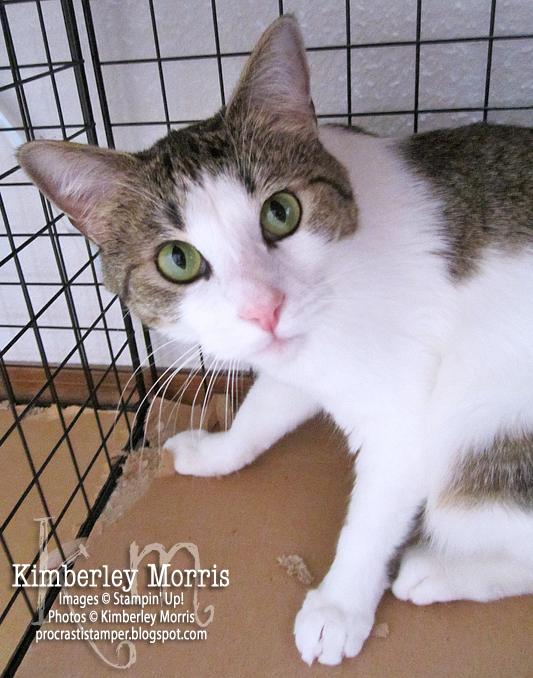 She's tearing up the cardboard lining my wire cube storage in protest. Soft Sky, Coastal Cabana, and Bermuda Bay are used here with Strawberry Slush. This is a card design I borrowed from another demonstrator (thanks, Patsy! 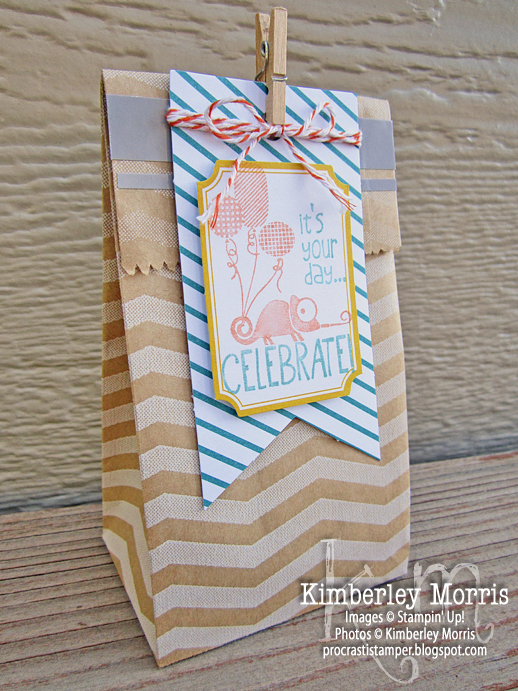 ), featuring the Sketched Birthday stamp set. I got this stamp set FREE, I believe it was at Stampin' Up! 's Leadership Conference in January. A clean and simple combo of Smoky Slate, and Coastal Cabana ink & DSP. 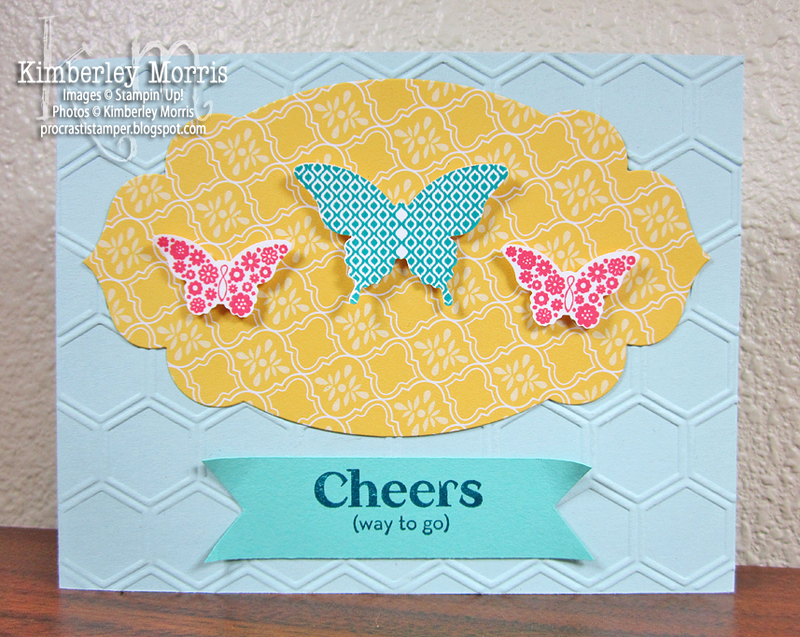 This card was inspired by another demonstrator's simple one layer card, pairing two coordinating stamp sets: Gorgeous Grunge, and Hello Lovely. I received both stamp sets for FREE at the Stampin' Up! Convention in July. Woo hooooo!! Pool Party in the back, Coastal Cabana and Bermuda Bay in the front! Don't forget the Melon Mambo and Crushed Curry...a color combo you can find on the Color Coach! 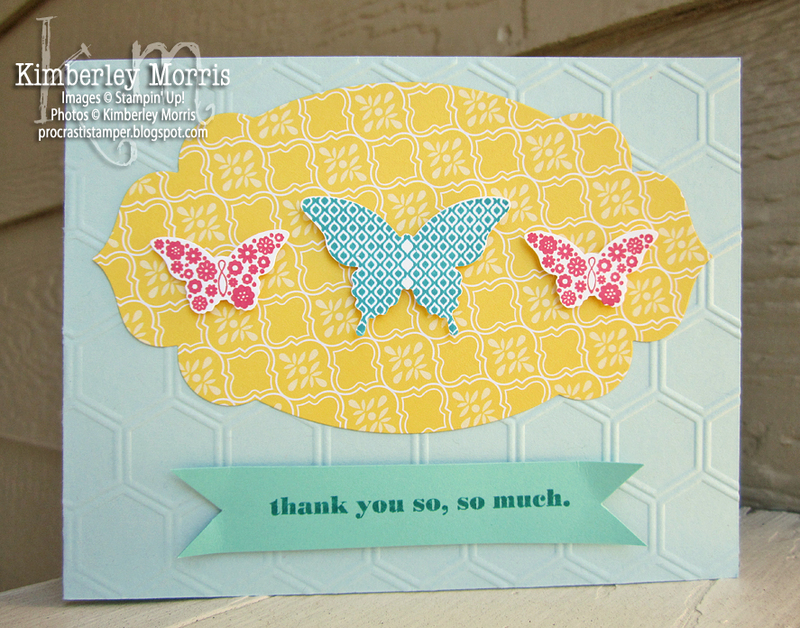 Stepping out of combinations which include my favorite color (blue), this last card features the NEW Another Thank You stamp set. Read more about this fabulous photopolymer set HERE. The bottom line is that you really need it. If you have tried photopolymer sets in the past, and not been happy with the quality of image you get with them--let me assure you, that is NOT a concern with Stampin' Up! 's photopolymer. And even with the heat embossing, this card only took like two minutes to make. FANTASTIC! Crisp Canteloupe on Baked Brown Sugar--sounds like a refreshing snack! UPDATE: Several more participating blogs have been added to the LNS 2013 Fall Treasure Hunt. 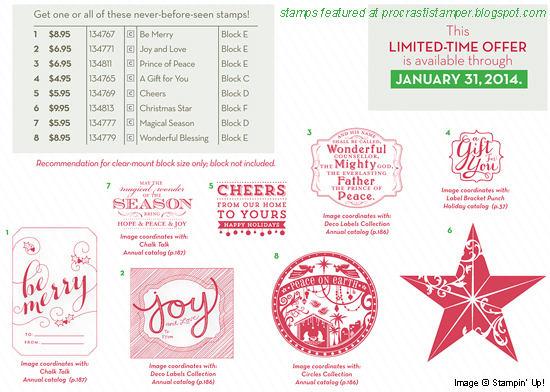 Go check it out--if you are a US player, you could WIN ALMOST $125 in FREE STAMPIN' UP! PRODUCT!!! If you live in or around Colorado Springs, join me for my August 8 Great Cards Class, where we'll make cards like this bright, cheery one--and more! Click the appropriate link to get information about, and to RSVP for, my Friday, August 23rd Session or my Saturday, August 24th Session. We will make the same 8 cards (2 each of 4 different designs) at each session, they are just offered at different times for your scheduling convenience. Interesting Factoid: Papillon Potpourri is one of Stampin' Up! 's best selling stamp sets...it is available in both wood-mount and clear-mount, and coordinates with both the Elegant Butterfly Punch, and the Bitty Butterfly Punch. UPDATE: More participating blogs have been added to the LNS 2013 Fall Treasure Hunt. 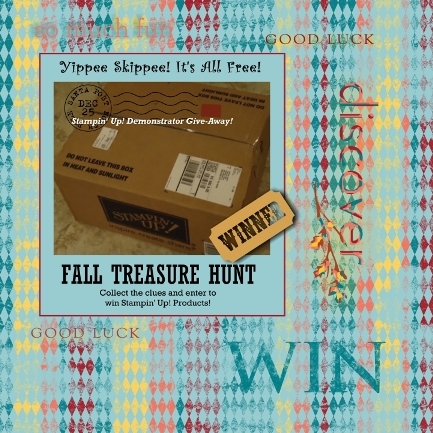 Go check it out--if you are a US player, you could WIN $100+ in FREE STAMPIN' UP! PRODUCT!!! So, in yesterday's post I promised you some upcoming samples using Thinlits. Today's cards were created using the NEW Expressions Thinlits, which is a set of three script words: Merry, thankful, and love. 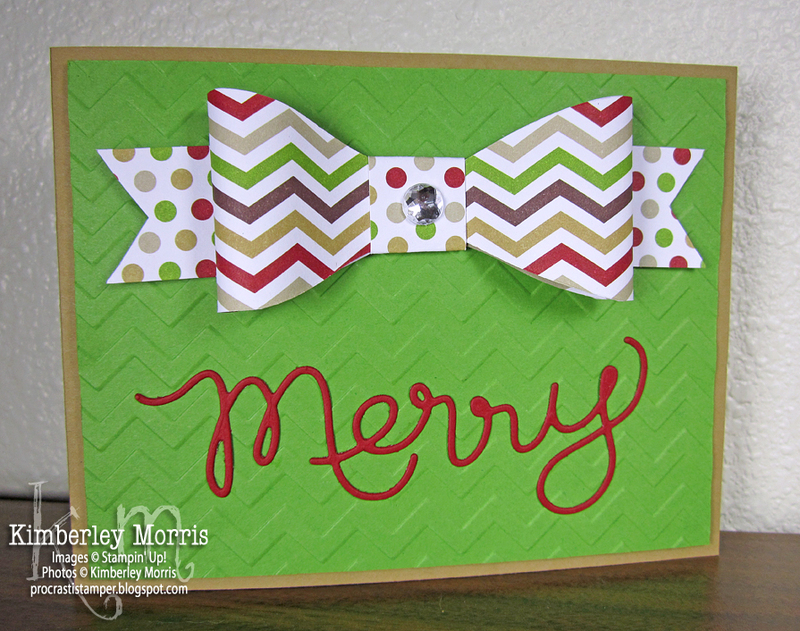 I used the word 'Merry', combined with paper from the NEW Season of Style Designer Series Paper Stack, as well as using the NEW Gift Bow Bigz L Die. One card uses the script word as it is cut out using the Thinlit, and the other card uses the negative space created by cutting out the word. Just in case you hadn't noticed...there is no stamping on either card, but I used the heck out of my Big Shot! Stampin' Supplies: Baked Brown Sugar card stock and Ruffle Stretch Trim, Gumball Green card stock, Cherry Cobbler card stock, Season of Style Designer Series Paper Stack, Expressions Thinlits (used with Big Shot), Gift Bow Bigz L Die (used with Big Shot), Chevron Embossing Folder (used with Big Shot), Perfect Polka Dots Embossing Folder, Whisper White Stitched Grosgrain Ribbon, Jumbo Rhinestones, Tombow Multi Glue (to adhere words). UPDATE: More participating blogs have been added to the LNS 2013 Fall Treasure Hunt. Go check it out--if you are a US player, you could WIN $99 in FREE STAMPIN' UP! PRODUCT!!! Once you've found that LNS 2013 Fall Treasure Hunt picture, you'll look a little further in the blog post to find the clue. Jot down the clue, and the blog it came from, and then go find the next one. Easy, right? One caveat: because our LNS 2013 Fall Treasure Hunt has just started, we don't quite have 50 participating blogs yet. No worries, our besties will join us soon. In the meantime, you may want to Subscribe to my Blog by Email to make sure you don't miss any notifications when new blogs are added! MY CLUE IS: THINLITS. I REPEAT, MY CLUE IS: THINLITS...! Stampin' Up! currently offers three Thinlits products: the Label Card Thinlits, the Circle Card Thinlits, and the Expressions Thinlits. 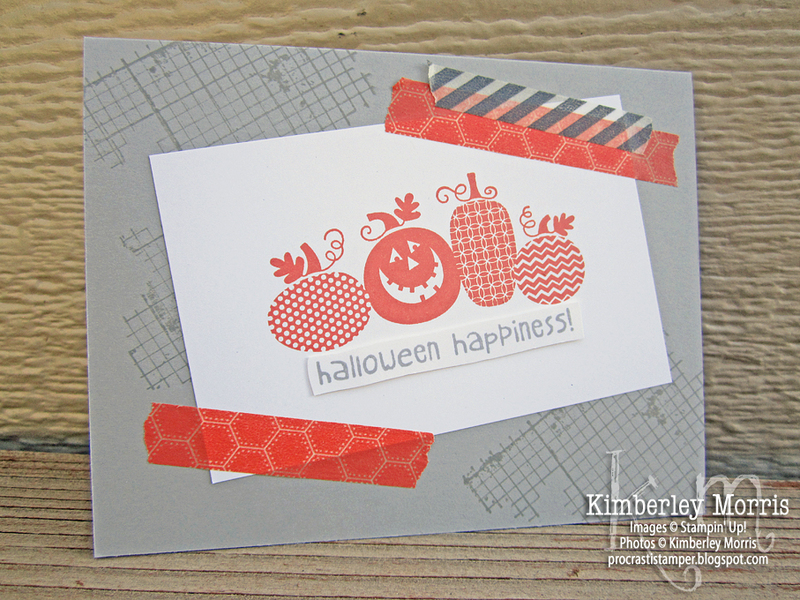 You'll want to stay tuned to my blog to see all the fun Thinlits sample cards and projects I have planned for you, throughout the LNS 2013 Fall Treasure Hunt. If you Subscribe to my Blog to get email updates, you won't miss any of them! 1) Leave a comment on this post, by 11:59pm MT on October 25, 2013, with your first name, last initial and email address (spelled out, like: procrastistamper at gmail dot com). Winners will be drawn no later than October 31, 2013, after which time, all comments on this post will be hidden/deleted to help protect your privacy. 2) You must indicate whether you are a Stampin' Up! Demonstrator, or a Stampin' Up! Fan/Customer, in your comment. Winning Blog Candy items will be chosen with this in mind. 6) You have FOUR CHANCES TO WIN! ONE Grand Prize Blog Candy winner will be chosen, and also, the first THREE entrants who email me a correct list of 50 clues/blogs for the LNS 2013 Fall Treasure Hunt, will win smaller Blog Candy prizes. 7) There is no obligation, commitment, or purchase required to enter my Procrastistamper Blog Candy Giveaway. However, if you would like to opt into my Customer Newsletter mailing list, you are welcome to sign up using the Subscribe Now button you'll find on the right sidebar of my blog. 1) Go to the list of Participating Blogs, under my signature block in this post. 3) Find the LNS Fall Treasure Hunt graphic on each blog. That's the blue one I've used near the top of this post! 4) Collect a clue from each of 50 different Participating Blogs, and create a list naming each clue along with the blog where you found it (i.e., Thinlits at http://procrastistamper.blogspot.com). 5) Email me your list of at least 50 clues/blogs at procrastistamper@gmail.com, in any of these formats: text, MS Word, Excel, or PDF. 6) The LNS 2013 Fall Treasure Hunt runs from Tuesday, August 20th to Friday, October 25th 2013, at 11:59pm PST. Winner will be drawn on October 28, 2013, and I will post the winners on my blog as soon as possible thereafter. 7) Each country/region that Stampin' Up! services will offer its own prize(s). If you cannot find the prize listed on a blog from your country, please check the Ambassador for your country, indicated by an asterisk after their name, in the Participating Blog list below. 8) There is no obligation, commitment, or purchase required to enter the LNS Fall 2013 Treasure Hunt. However, if you would like to opt into my Customer Newsletter mailing list, you are welcome to sign up using the Subscribe Now button you'll find on the right sidebar of my blog. TIP: You can get an entry for *every* list you send to each different Participating Blog...send your list to all 50 of the blogs you find clues on, and get 50 entries for the Grand Prize! 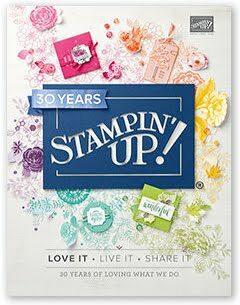 Seriously, I ordered mine last Thursday as soon as it became available, and my order just shipped out this morning :-) If you've been wanting to try out Stampin' Up! 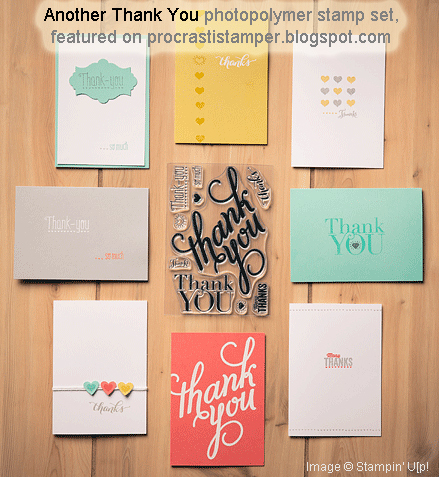 's photopolymer stamps, but previous offerings haven't suited your taste, you are in luck with the NEW Another Thank You photopolymer stamp set! There are 10 images in the set, which I will detail following the picture below. The cards in the picture above are standard size (4-1/4" x 5-1/2") cards, so that should give you an excellent idea of the size of each image. These images are completely clear--the black you see showing through the stamps in the picture above is the printing on the index sheet which is included for storing the stamps. The index sheet, with all the stamps on it, comes in a plastic envelope. But there's no reason to mess with trying to pull the set out and put it back in that little close-fitting cello bag, when it fits so neatly into one of Stampin' Up! 's Clear-Mount Stamp Cases. 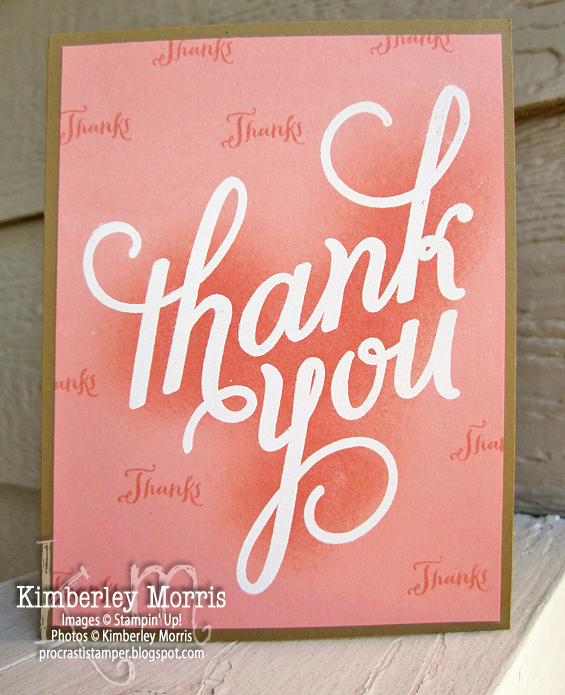 The following Stampin' Up! Clear-Mount Block sizes are recommended: A, B, C, D, and F. By the way, you can get 15% OFF if you order the entire Clear Block Bundle (sizes A-I), and that will cover you for this set, and any other photopolymer or clear-mount stamps you'd like to order. (NOTE: we have several stamps that are offered ONLY in clear-mount, such as our Best of 25 Years stamp sets, as well as our NEW Holiday Single Stamps! 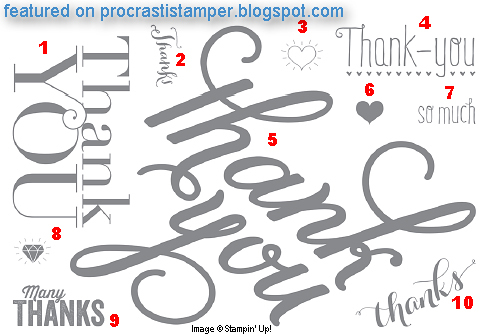 Another Thank You stamp set images are: 1) Block Thank You, 2) Small Script Capitalized Thanks, 3) Heart Outline with Rays, 4) Thank-you with heart underline, 5) Large Bold Script thank you, 6) solid heart (fits inside heart outline), 7) so much stamp (coordinates with image 4), 8) solid diamond with rays, 9) Many THANKS stamp, and 10) Small Script Lowercase thanks. Before you finalize your Online Order, be sure to check out our Show & Tell BUNDLE: get 15% OFF when you order the Seeing the Possibilities Downloadable Class + Show & Tell 1 photopolymer stamp set + Show & Tell 2 photopolymer stamp set! 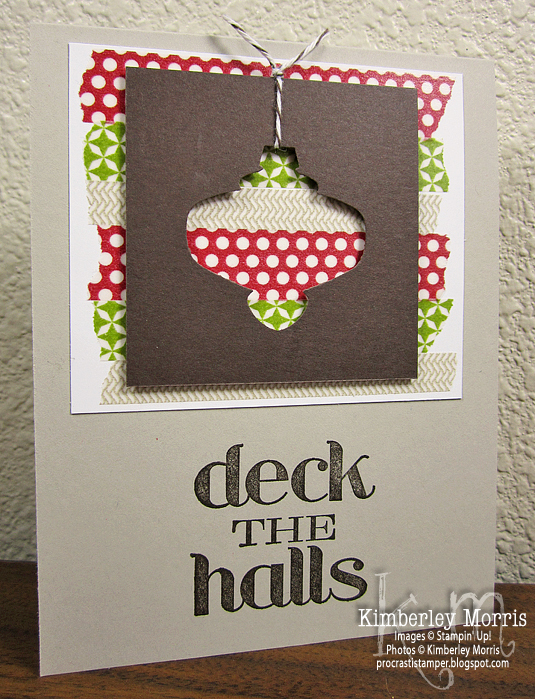 Deck the Halls Stampin' Supplies: Christmas Messages stamp set, Sahara Sand card stock, Whisper White card stock, Early Espresso ink & card stock, Season of Style Designer Washi Tape, Christmas Ornament Punch, Early Espresso Baker's Twine, Stampin' Dimensionals. 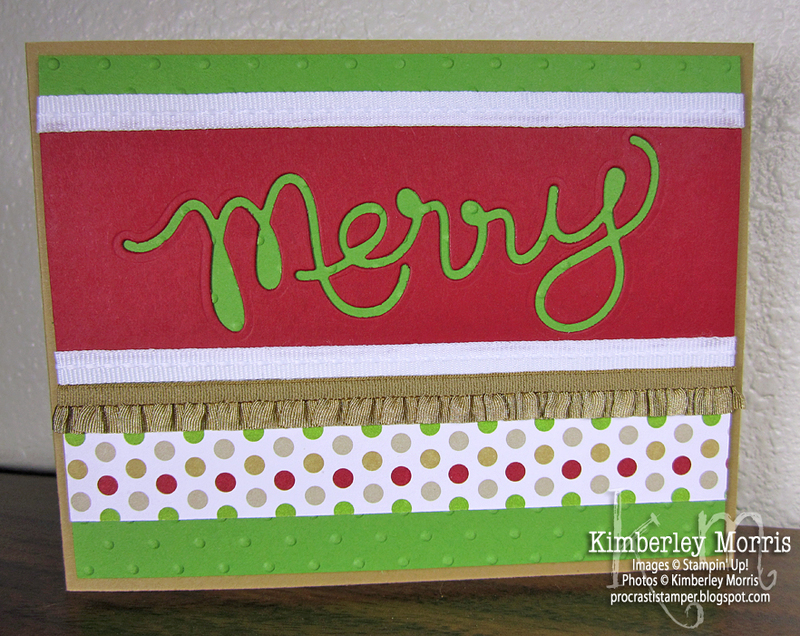 Holly Jolly Stampin' Supplies: Tags 4 You stamp set, Gumball Green card stock, Cherry Cobbler card stock & ink, Whisper White card stock, Baked Brown Sugar card stock, Season of Style Designer Washi Tape, Label Bracket Punch, Stampin' Dimensionals. Here is a picture of the whole stamp set, and you can get the Halloween Hello Wood-Mount Stamp Set or the Halloween Hello Clear-Mount Stamp Set. Personally, because the images are on the small side, I got the wood-mount. Smaller images tend to get lost on my desk, or batted around by my cat, and I stand a much better chance of finding them with that wood block attached! The bat is my favorite image, and the candy corns come in a close second. I don't mind skull images if they aren't creepy, and the silly one in this set is just perfect for me. Can't you just see how funny it would look with little googlie eyes?? The washi tape is fantastic, I highly recommend it! It is super easy to work with, it tears easily, and even peels back without tearing your card stock, if you decide it's not quite where you want it. Its low-tack makes it perfect to mask off parts of your card when spritzing or sponging, yet it still sticks down smoothly and securely. This is not just cheap dollar store cello tape or masking tape with patterns printed on it--it is super high quality, with an almost waxy finish that lends durability, and offers a classy, satiny finish. 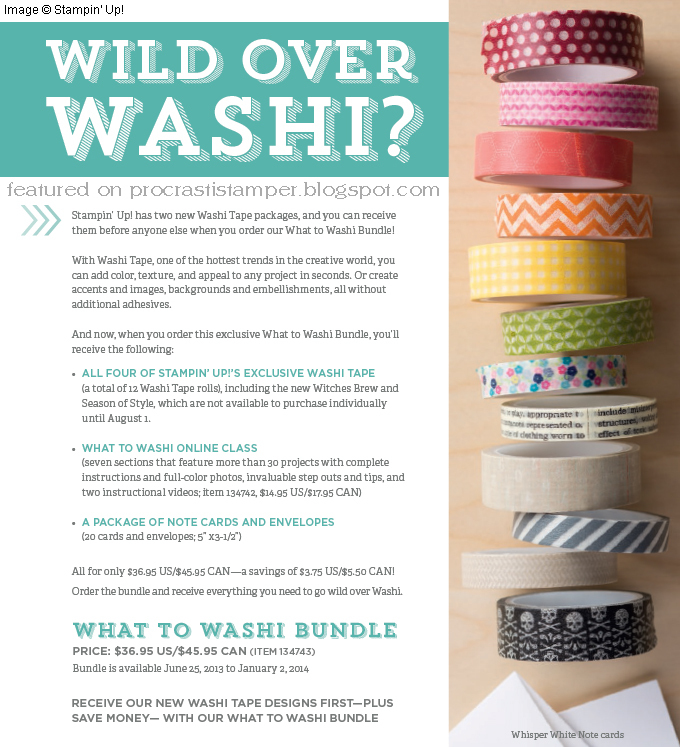 Although the class bundle offers all 12 rolls of washi tapes that Stampin' Up! offers, the designs are offered in individual packages of 3 rolls each. Click on any of these package names to see the tapes bundled in each: Epic Day This and That Designer Washi Tape, Gingham Garden Designer Washi Tape, Season of Style Designer Washi Tape, and Witches' Brew Designer Washi Tape. Mix and match your washi tape between packages for even MORE versatility. Did you know that you can get two months of Paper Pumpkin by Stampin' Up!, shipped directly to you, for only $10 a month*? This is a 50% savings off the regular price of $19.95*. Just sign up using THIS LINK, and enter the promo code PUMPKINDEAL, and enjoy your savings! *Price includes shipping. Applicable taxes will be added. - Paper Pumpkin projects are not previewed, each month is a surprise! - Except...your first month's kit will be the Welcome Kit, not the unique monthly kit. 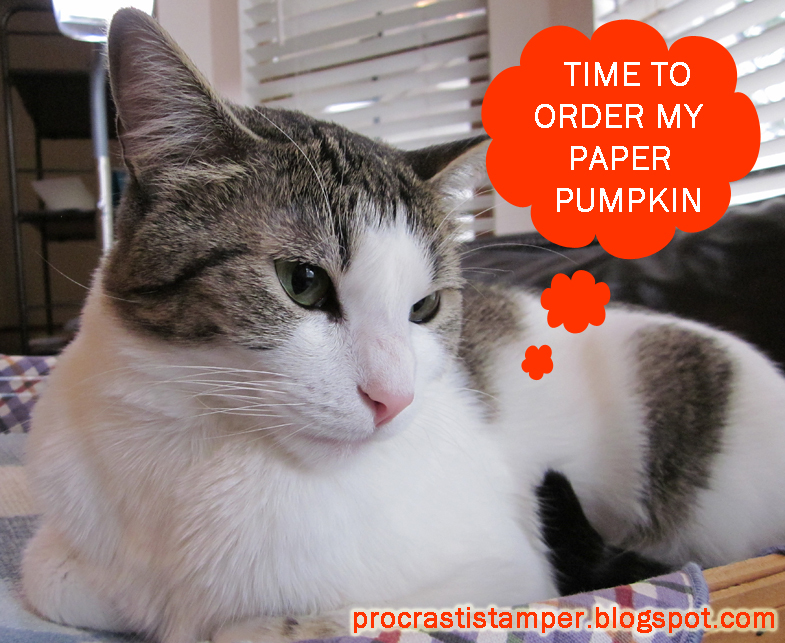 - Although Paper Pumpkin is a subscription, you can skip a month or cancel at anytime. - Promotional price is valid only on ONE kit each month, add'l kits are $19.95 each. - You can EMAIL ME with questions at any time!!! I know, right?!? Go get your Paper Pumpkin now...CLICK HERE and JOIN!!! Stampin' Up! has a NEW product available--Thinlits Card Dies!!! These card dies are ready to order right now, and there are two selections: the Label Card Thinlits Die, and the Circle Card Thinlits Die. Each item is actually a set of dies, including a card base, and several accents. The card base die for each cuts and scores a card which folds down to standard card size (4-1/4" x 5-1/2"), with a focal point that flips around when you pull the card open. 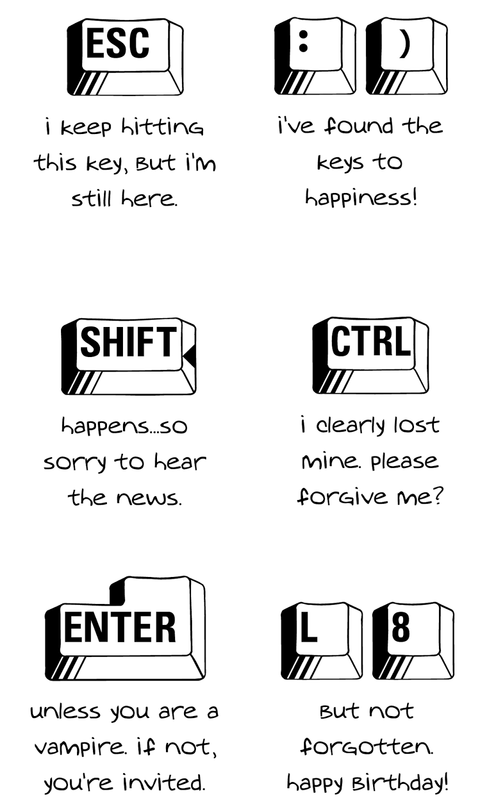 You may know these as "flip cards" or "swing cards". Let me give you the skinny on each one separately, because they are not shown in any catalogs. 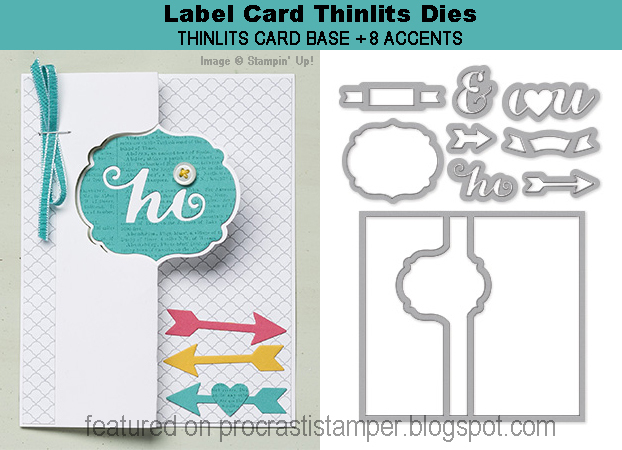 Label Card Thinlits Die (Set): This set includes 9 dies: the card base + 8 accent dies. A special feature of this set is what I call a "pop-up banner". Each of the two banners in this set have score lines, which allows the ends of the banner to be adhered flat, while the center of the banner is suspended above. Super cool design feature! 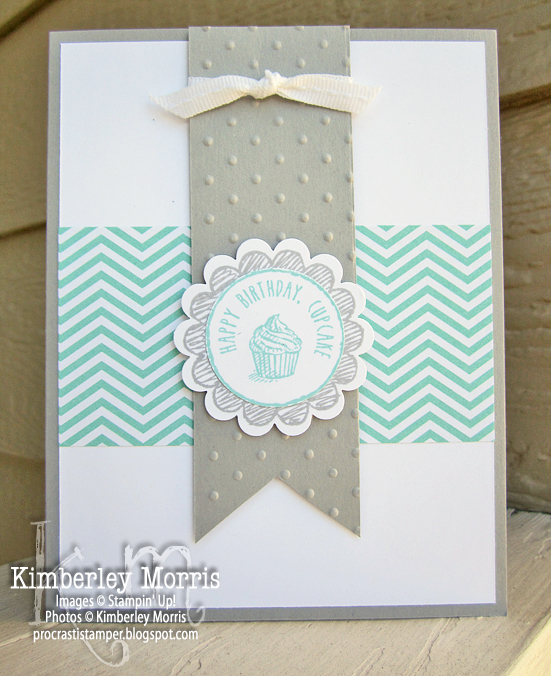 The swinging label on the card base coordinates with our Labels Collection Framelit Die set. 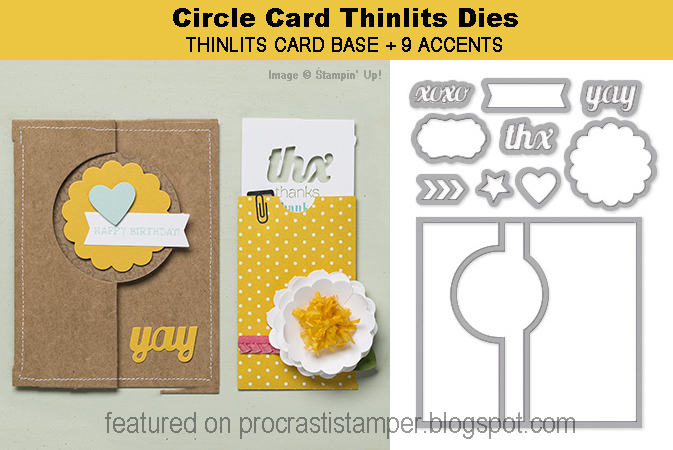 Circle Card Thinlits Die (Set): This set includes 10 dies: the card base + 9 accent dies. While the banner in this set is flat, there are many wonderful small accents, including some really cool chevrons that I'm sure you'll want to use on ALL your projects! The swinging circle label coordinates not only with our many circle punches and dies, you can see it also coordinates with our scallop circles. 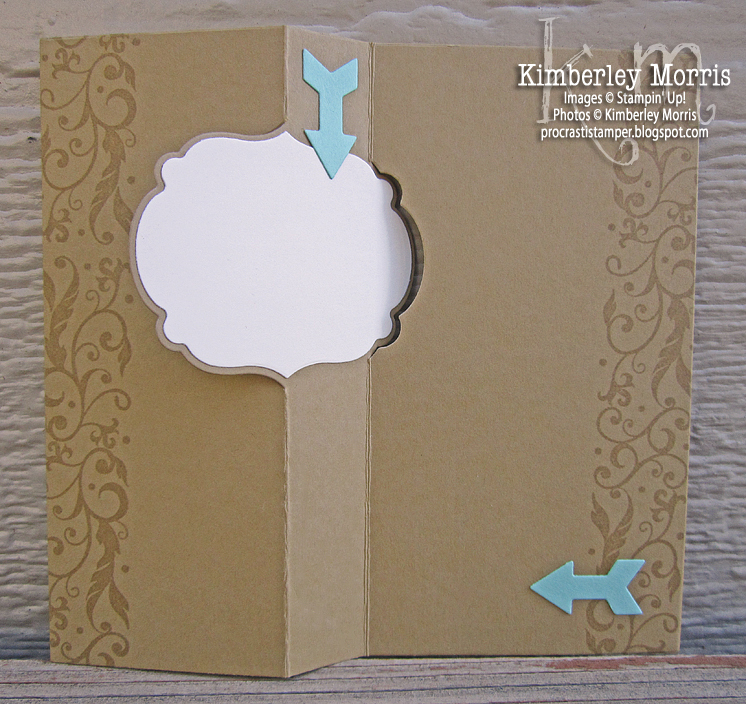 There are many other designs you can create, using the card base in alternative ways. And we have so many other products that coordinate with these--there are millions of possibilities!!! Stay tuned to my blog to see some of those ideas featured :-) If you're ready to order, click on the product description for either set, or both, to be taken to my Online Store, where you can add them to your Shopping Bag. Stampin' Up! 2013 Holiday Catalog Debuts TODAY!